In exploring reactions that proceed along the carbocation pathway, every once in awhile you might see an example of an addition reaction that looks a little… strange. The alkene is gone, two new bonds have formed, but the positions of the new bonds is a little out of the ordinary. Like in this example! If you tally up the bonds that form and the bonds that break, we notice that there is an extra set of C-H bond forming/breaking events. If you’ve seen the previous articles in the substitution and elimination series, this should look familiar. It’s a telltale sign that a rearrangement has taken place. [If you haven’t seen rearrangements before, read this. If you have, you can skip to the “walkthrough of an addition with rearrangement” section.] Rearrangements can accompany any reaction that proceeds through a carbocation, be it substitution (SN1), elimination (E1) or, as we’ve just seen, addition. Bearing less than a full octet of electrons, carbocations are unstable intermediates. Being electron-poor, the stability of a given carbocation greatly depends on the extent to which the atoms adjacent to it can donate electron density, either through resonance, “inductive effects”, or (although rarely taught) “hyperconjugation”. Rearrangements occur when an entire bonding pair of electrons migrates to a carbocation from one of its neighbors. This will be favorable when a new, more stable carbocation is formed. The bonding pair in question may be attached to a hydrogen or alkyl group. Migrations of a hydrogen with its lone pair are called “hydride shifts”; migrations of a carbon atom with its lone pair are called “alkyl shifts”. The first step in this reaction we’ve seen before: attack of the alkene upon the electrophile (in this case, the H of H-Cl). The result is a carbocation. Note that the carbocation that’s been formed is a secondary carbocation, and it’s adjacent to a tertiary carbon. In this next step, the lone pair in the C-H bond migrates from the tertiary carbon to the secondary, forming a new (tertiary) carbocation. The driving force for this reaction is formation of the more stable carbocation. Note how it’s just one arrow we’re drawing here! The same arrow shows C-H bond breakage and C-H bond forming. We’ve also seen the third step before. Attack of the nucleophile (chloride ion) upon the new carbocation gives us our new alkyl halide! 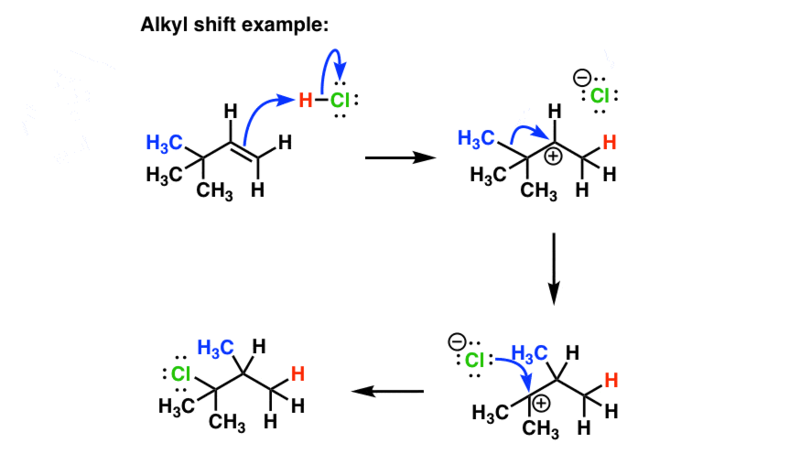 Rearrangements can also occur with alkyl shifts, as seen in the example below. Note again that the rearrangement step is represented by just one curved arrow! Finally, one of the cases that students often find very difficult is in recognizing reactions that occur with rings (ring expansion or ring contraction). Although perhaps difficult to see, in fact it proceeds through exactly the same mechanism as in the cases above. Note again that we’re depicting the rearrangement reaction with a single curved arrow. [Hint – if you’re doing this on your own, it might help to draw the ugly version first]. So why is it that the carbon from the ring migrates, and not the CH3 as before? A fair question. Migration of the CH3 would indeed produce a tertiary carbocation. However, migration of the CH2 from the ring not only produces a tertiary carbon but incrases the size of the ring from 4-membered to 5-membered, which relieves considerable ring strain present in the cyclobutane ring (worth about 26 kcal/mol). That about does it for the carbocation pathway of alkene addition reactions. In the next post we’ll go into the second (of three) major pathways for alkene addition mechanisms. NEXT POST: Bromination of Alkenes – How Does It Work? In the penultimate scheme, the 3rd structure, there’s a CH2 instead of a methyl CH3. Are these rearrangements termed 1,2 hydride shifts and 1,2 alkyl shifts? Yes they are – or Wagner-Meerwein shifts. So if you had HCl addition to just vinylcyclobutane (no methyl group as in the example above)… would you give the product as 1-chloro-2-methylcyclobutane or 1-chloro-1-methylcyclobutane? Do you mean cyclopentane instead of cyclobutane? If so, I’d think the 1-chloro-1-methylcyclopentane product would eventually result. Curious as to what experiment has to say. I am also curious as to what experiment would say… hmm…. In case of addition of HBr to 3-methylcyclohexene..what will be the major product? I think it will be 1-bromo 1-methylcyclohexane but my teacher thinks otherwise, saying there will be no rearrangement. What do you think will happen? and why? Hi – addition of HBr to 3-methylcyclohexene, proposing a rearrangement is very reasonable, as it would mean that a secondary carbocation would be rearranging to a tertiary carbocation. Some profs are not very consistent when it comes to these things. What if HCl is to be added across 1-Chloroethene ? Does the resulting carbocation stability and the position of the positive charge depend upon the fact that “for halogens inductive>mesomeric effect” ? The chloride would stabilize the carbocation through resonance (donation of lone pair) . So protonation would occur adjacent to the carbon attached to chlorine, and the resulting product is a dihalide. when 1 methyl 2 cyclohexene reacted with HBr than what will be the major product? Can a type of cyclopentene undergo a carbocation rearrangement to form a cyclohexane?